The biggest challenge of hosting your website(s) is maintaining high security standards and protecting your users from attacks. 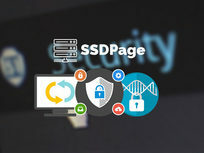 That's why you need enterprise-grade security like SSDPage on your WordPress sites. Whether you're worried about CXS malware, DDOS attacks, or virtually any other cybercriminal activity, SSDPage has your sites covered.